↑ "Module 11: Ayurvedic". Retrieved 2008-02-11. ↑ eFloras. 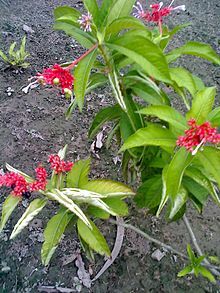 "Rauvolfia serpentina". Flora of China. Missouri Botanical Garden, St. Louis, MO & Harvard University Herbaria, Cambridge, MA. Retrieved 9 April 2012. ↑ Oudhia, P. and Tripathi, R.S. (2002).Identification, cultivation and export of important medicinal plants. In Proc. National Seminar on Horticulture Development in Chhattisgarh: Vision and Vistas. Indira Gandhi Agricultural University, Raipur (India) 21-23 Jan. 2002:78-85.